Ever since I published the first post on this blog back in October, Lernabit has been a lot of fun. People have told me how much they like the idea and many have provided awesome feedback and suggestions. What most people don't know is how I have been building it up to this point. The first version of Lernabit was built on a netbook. An Asus Eee PC to be exact. Any web developer would agree that such a low quality computer makes modern web development very slow, and even painful. But I simply did not have a better computer or the money to get one. What I did have (and still do) is a passion and dedication to make education better, so I pushed forward using the tools available. Some things have now changed. About a month ago, I won a HeroX prize for presenting my ideas for ways to improve financial education. It was a relatively small prize, but it was a big moment. The goal of the contest was to uncover the problems with financial education, but the ideas I presented can also apply to education in general. Winning this contest was validation of some of the fundamental ideas behind Lernabit. In addition, there was some prize money involved, which I used to buy a fantastic new computer. All of this means that I now have the tools and funding to build the Lernabit I have wanted to create all along. As a result, I have decided that I will be relaunching Lernabit. So allow me to explain what will be happening and what will change. Why is the relaunch necessary? One question I have been asked is why I would relaunch the site instead of modifying what I already have. This was a tough call to make, and the rationale is mostly due to technical considerations. Even before winning my prize, there were some design flaws in Lernabit that were beginning to surface. I'll probably write a second blog post explaining the more technical details for anyone who is interested, but to put it simply, some of technology used in version 1 of the site does not work very well with where I want Lernabit to go. The feedback from people using the site has given me new ideas and insight into what Lernabit can become, and I began to realize that the technology that was being used wouldn't have been the best tool for the job. After considering all of those facts, I decided it would be just as easy to rebuild the site completely rather than attempt to modify what I had. I also decided that the best thing to do from a business perspective would be to essentially take the site offline so I could focus on building the new site without worrying about maintaining the existing one. As mentioned earlier, most of the changes will be technical improvements. But as long as I am rebuilding the site anyway, I will also use this as an opportunity to fix most of the problems people have mentioned, and a few I have noticed myself. One improvement will be a much better login experience. The new site will remember your login status between visits rather than requiring you to login every time. Then you will only be prompted for a password when doing things like changing personal information. You will also notice a cleaner and more modern design. Less text and more generous use of icons will make it easier to browse the page and find what you want. The new design will also make it easier to do things like interacting with the site without interrupting audio playback. Another big change will involve the topics that are covered. Up to this point, Lernabit has been focused on science education. The new site will cover a wider range of topics. Finally, the relaunch will include a native Android app. If my mission is to make education more accessible throughout your day, a better mobile experience is an absolute necessity. I haven't decided if the mobile app will be available immediately when the site relaunches or if it will be ready shortly afterward, but such an app is in progress. As for iOS, there is not a native iOS app planned right now, although I would like to eventually have one built. In the meantime, the new site will work better on mobile devices. While not as good as a native app, the site will still work like a charm on whatever mobile device you want to use. 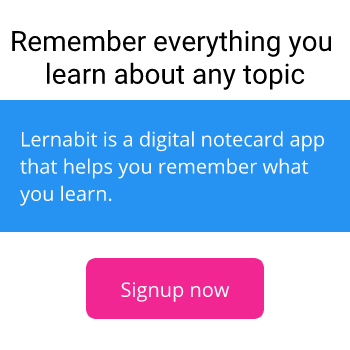 I want to emphasize that Lernabit is not shutting down. In fact, it is quite the opposite. Not only is the site not shutting down, it will be coming back stronger and better than before. Going offline is just a way to make that happen faster by letting me focus on building the new site. Also, before I wrap up this post, I want to thank everyone who has been using Lernabit. I appreciate every single person who has tried it out, and I love hearing the feedback people have been providing. I do listen to it, and it is very helpful. So thank you. With such an awesome group of people using the site, I know that the next generation of Lernabit will be a powerful force to improve education around the world.